This award winning restaurant is an exquisite dining experience on a regular evening, but Thursdays are out this world for seafood lovers! Line up with your empty plate in hand and be in awe at the array of fresh seafood, it's like a rainbow on ice. 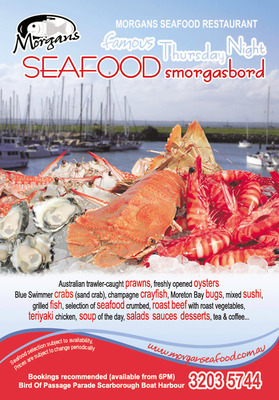 Oysters, huge fresh prawns straight from the trawlers, fish, scallops, crab, lobster and even beautiful fruits. As well as the most amazing seafood in Queensland, you can satisfy that sweet tooth with a lovely range of desserts. With a stunning view and the sparkle of fairy lights, there is no better way to spend a Thursday night if you are a seafood lover. Listen the small waves lap against the boats, feel the breeze on your face or sit inside and take in that irresistible aroma of fresh seafood. We bought a bottle of wine with our meal so it was a pricey meal, however, this is the freshest you will find in Brisbane with the best location, so it is well worth not only the drive to Scarborough on the North side of the city, but worth paying that extra bit to taste nothing but the best. Even the tartare sauce is incredible! 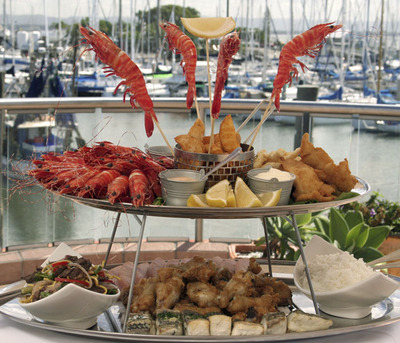 Prices are subject to change and bookings for the famous Morgan's Seafood Smorgasbord is essential so jump on the phones, (07) 3203 5744. The link is going straight to Marine world seafood at Tingalpa!! How much does the buffet cost more or less?